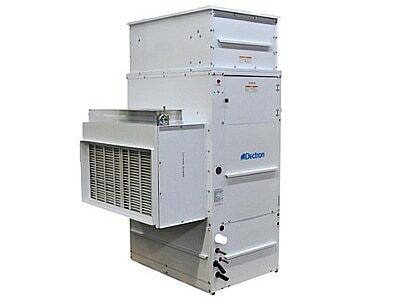 H & H provides Superior Installation and Service for Dectron Dehumidification Systems. Dectron is a global provider of highly-engineered custom and semi-custom IAQ (Indoor Air Quality) and HVAC (Heating, Ventilation & Air Conditioning) products and services catering to the building systems, food processing, medical, petrochemical, recreation, hospitality, and telecommunications industries. Dectron HVAC solutions specialize in dehumidification, precision air-conditioning and air purification systems. For over 30 years, we at H&H Commercial Services have provided superior heating, ventilation, air-conditioning and pool room dehumidification solutions to residential and commercial customers in and around Philadelphia City. This means we have the expertise to get you the perfect system for your space. Irrespective of the size of your property or the complexity of your business operations. Dectron Dry-O-Tron: A mechanical dehumidification system to control humidity and use the same energy by-products to increase comfort. Dectron Eco-Tron: A custom integrated air-conditioning, dehumidification, energy recovery and makeup air system. Dectron Circul-Aire: The only multi-disciplinary approach with single source responsibility for meeting ASHRAE standards in humidity, ventilation, purification, and comfort. ThemoPlus Air: Has the unique design capabilities to meet custom and specialized requirements. H&H Commercial Services, Inc. offers personalized attention with custom solutions. This means we take the time to find the exact heating, ventilation, air-conditioning, pool units and dehumidification system for your needs. Contact us at 610-532-8745 for expert maintenance and installation of pool dehumidifiers around Philadelphia and the Tri-State Area.